Whimsical. Quaint. Flowing. A fairy tale that defies the normal constructs of the genre. A fantasy defined by it’s depiction of the ordinary. When I began this book, which opens with mention of “the Pixie,” I couldn’t tell quite what I had stepped foot into. For someone unversed in the creatures of fairy tales, I wasn’t even sure what a pixie was. I still don’t know, for it turns out the character called “the Pixie” is an entirely human girl bearing that nickname. While the first books I read from Rachel Starr Thomson‘s collection (The Seventh World Trilogy) drew out the haunting, terrifying darkness of evil, this book displays the power of goodness and the sparkle of light. If you want to read an edge-of-your-seat, blood-pressure raising narrative, this book will disappoint you. 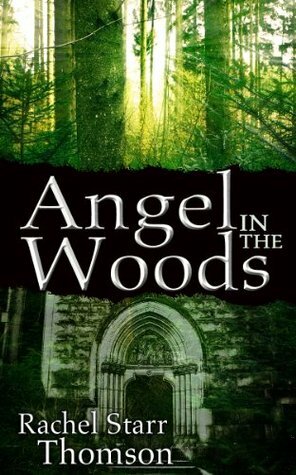 However, if you’re looking for a story that will inspire you to become a better person and leave you with a warm glow in your heart, Angel in the Woods will do so in a manner as unique as the story itself. KINDLE USERS ALERT: I can lend the Kindle version of this book to one of my blog readers. If you have a Kindle and would like to read Angel in the Words, say so in the comments, and I’ll send it your way. (Please, only ask if you have time to read it within the 14 day lending period.) First come, first serve. It’s on it’s way. Enjoy! No. No magic at all. It worked the same way for me! I couldn’t figure out the characters at first, but once things began falling into place it was such a sweet story. Gotta love warm fuzzies. So glad you got to enjoy it too! I was curious….how do you loan books? I own some books on my kindle and if I can, I would love to share them with others.